This afternoon the second LGBTQ Outdoor Summit comes to an end. As its name suggests this was a meeting of members of the lgbt community who have some involvement with the great outdoors. This could be anything from camping and hiking to climbing Everest or rowing across the Pacific. 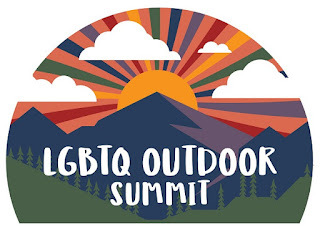 The summit was also a meeting of minds to discuss and develop outdoor activities and involvement for openly lgbt adventurers and environmentalists. The keynote speaker was Silvia Vasquez-Lavado, an openly lesbian mountaineer whose record-breaking feats are mentioned below. Silvia is one of several lgbt climbers who have completed the Seven Summit challenge (as completed by Cason Crane here). On a side note, Cason's youngest brother, Oliver, who isn't gay as far as I know, currently hold the Guinness World Record as the youngest ever solo ocean rower. In 2017 he rowed solo across the Atlantic at the age of 19. What a family! In recent years the activities of openly lgbt adventurers and extreme athletes have been more widely reported. Some of these have entered the record books. Below is a selection of Xtreme lgbt record-breakers, firsts and notable achievers who are proud members of an Xtremely queer club (in alphabetical order). David Alviar (b.1986) – first (and, therefore, the fastest) to row across the Atlantic in a crew of 3, 2016. David and crewmates Mike Matson and Brian Krauskopf took part in the 2016 Talisker Whisky Atlantic Challenge (see also Gavan Hennigan below). They took 49 days and 14 hours to row from Tenerife to Antigua. The first thing David did when he set foot on dry land was propose to his partner Stanley (who said “yes”). Ann Bancroft (b.1955) – first woman to reach the North Pole on foot, 1985; first woman to reach the North and South Pole, 1993; leader of the first all-female east-to-west crossing of Greenland on foot, 1992; with Liv Arnesen the first women to ski across Antarctica, 2001. More information is here. Mike Boisvert, Bruce Gallipeau, Rob Jagnow and Jonny Rosenfield – the first all-gay team to summit Aconcagua, the highest mountain in western hemisphere, and the first all-gay team to climb one of the Seven Summits, 2005. Bruce had climbed Aconcagua before but was not openly gay at the time. Aleister Crowley (1875-1947) – member of the first expedition to climb the world’s second highest mountain, Chogo Ri (or K2), 1902; leader of the first expedition to climb the world’s third highest mountain, Kangchenjunga, 1905. Both expeditions failed. This famous occultist was an enthusiastic mountaineer in his youth, and he developed the use of crampons. You can read more about his mountaineering here. Keith Culver (b.1947) – the first man over 60, and first openly gay man, to complete the Seven Continents marathon challenge, 2007. The Seven Continents is the running equivalent of the Seven Summits, in which athletes run in at least one official marathon on each continent. Keith completed his last Seven Continents marathon just after his 60th birthday. He also competed in the marathon at the Gay Games in San Francisco 1986 and Sydney 2002. Marty Filipowski (b.1963) – the 100th person to swim the Cook Strait separating the north and south islands of New Zealand, 2017. The 14-mile wide Cook Strait is one of the Oceans Seven, the long-distance swimming equivalent of the Seven Summits and Seven Continents. The swims include the English Channel which Marty swam on his 50th birthday. His most recent Oceans Seven swim was across the North Channel between Scotland and Ireland last month (in honour of his father who died the week before). Marty has also competed at the Gay Games. He has only one more Oceans Seven swim to complete before he joins the exclusive club of just 11 people to have done all seven to date. Richard Haliburton (1900-1939?) – the first person to swim the Panama Canal through the locks, 1928. Although not the first person to swim the canal he was the first to go through all the locks taking him a total of 50 swimming hours over 10 days. Most of the time was taken up waiting for the locks to operate. Even though some have questioned whether he was gay his own great-niece has said that there’s no doubt in the family that he was. A renowned traveller and adventurer, Richard disappeared with his crew during a trans-Pacific voyage in a Chinese junk in 1939. Greg Healey – first known openly gay man to summit Everest, 2012; 20,000 mile solo cycle around the world, 2013. When Cason Crane, the second openly gay man to summit Everest, was making his bid Greg was halfway through a 20,000 mile solo cycle ride. Greg was in Peru when Cason reached the top of Everest (exactly 51 weeks after Greg was there). Gavan Hennigan (b.1982) – fastest solo row across the Atlantic (east to west), 2016. This was the second record broken by an lgbt rower during the 2016 Talisker Whisky Atlantic Challenge (see David Alviar above). Stephen Junk (b.1960) – the first Australian to complete six of the Oceans Seven swims (see Marty Filipowski above). Stephen has only to swim the North Channel from Scotland to Ireland to be the first Australian to complete the Oceans Seven. Will he beat Marty Filipowski to the title of first lgbt swimmer to join the 11-member Ocean Seven club? Steven has competed in swimming in 2 Gay Games, winning 2 golds, 2 silvers and a bronze at the 2002 Sydney games. George Mallory (1886-1924) – member of the first expedition who intended to reach the top of Everest, 1922; the first known lgbt mountaineer on Everest, 1922; the first lgbt Olympic medallist and first lgbt gold medallist, 1924. At the closing ceremony of the first ever Olympic Winter Games in Chamonix in 1924 Baron Pierre de Coubertin, the founder of the modern games, awarded gold medals to all members of the 1922 Everest expedition, which included George Mallory, in recognition of their (failed) attempt. At the time of the ceremony George was heading back to Everest on the expedition that would take his life later that year. He never got to see or touch his medal. Angela Madsen (b.1960) – (take a deep breath!) – the first woman to complete three ocean rows (Atlantic 2008 and 2011, Indian Ocean 2009); the first woman (in a mixed team of 8), the oldest woman, and first open lesbian to row across the Indian Ocean (in a record time that still stands) 2009; the first woman with a disability to row across the Atlantic Ocean, 2007; member of the fastest unsupported team (and first all-female crew) to row non-stop around the British Isles, 2010. All of these are Guinness World records. On top of all that Angela is the oldest lgbt competitor at the Paralympic Games (Rio 2016), older than any lgbt Olympian, competing in rowing (obviously) and athletics. Diane Nyad (b.1949) – first person to swim from Cuba to Florida without a shark protection cage, 2013; world record for the longest non-stop swim without a wet suit, 1979; world record for longest open water swim without a shark cage (102 miles), 1979. A multiple long-distance swimmer. Sarah Outen (b.1985) – the youngest woman to row solo across the Indian Ocean (at the time also the youngest person), 2009; the first and only person to row solo across the mid-Pacific Ocean from America to Asia. Also rowing across the Indian Ocean at the same time as Sarah was Angela Madsen (above), meaning that the youngest and oldest women to row the Indian Ocean were doing so at the same time. Angela, in a team of 8, finished 5 weeks sooner in a world record time. In 2011 Sarah began her London2London challenge, which I wrote about here. Rainbow Skydivers – largest skydiving vertical (dead-down) freefall formation, 2012. Rainbow Skydivers is probably the world’s only lgbt skydiving group. In August 2012 fifteen members of Rainbow Skydivers joined 123 others, including many of the world’s top skydivers, over Ottawa, Canada, to perform the largest vertical skydiving formation. A video of the jump is here (don’t forget, it’s head-down, so the ground is at the TOP). The record has been surpassed several times since then. Sally Ride (1951-2012) – first American female astronaut and, retrospectively, the first lgbt person to go into space, 1983. Going into space is the ultimate adventure. Sally was openly lesbian to her family, friends and colleagues, but her sexuality was not generally known until after her death. See here for her story. Ben Smith (b.1972) – ran 401 marathons in 401 days. Ben ran marathons all around the UK to raise awareness of bullying, something which he suffered himself while at school not far from where I was living at the time in North Nottinghamshire. The first marathon started on 1st September 2015 and the last was on 5th October 2016. He ran a marathon in North Nottinghamshire in May 2016. Silvia Vasquez-Lavado (b.1975) – the first Peruvian woman, and the first openly lesbian woman, to reach the summit of Everest, 2016; the first Peruvian citizen, and first openly lesbian woman to complete the Seven Summits, 2017. Silvia is founder of Courageous Girls, an adventure and outdoor organisation that supports female victims of sexual abuse. There are many, many more lgbt adventurers and endurance athletes who could have been included. All of their achievements and records are worthy of being collected together in a book, one of the dozens of projects buzzing around in my mind at the moment. I hope, at least, I’ve given you a feel of the adventurous and fearless spirit that exists in the lgbt community.